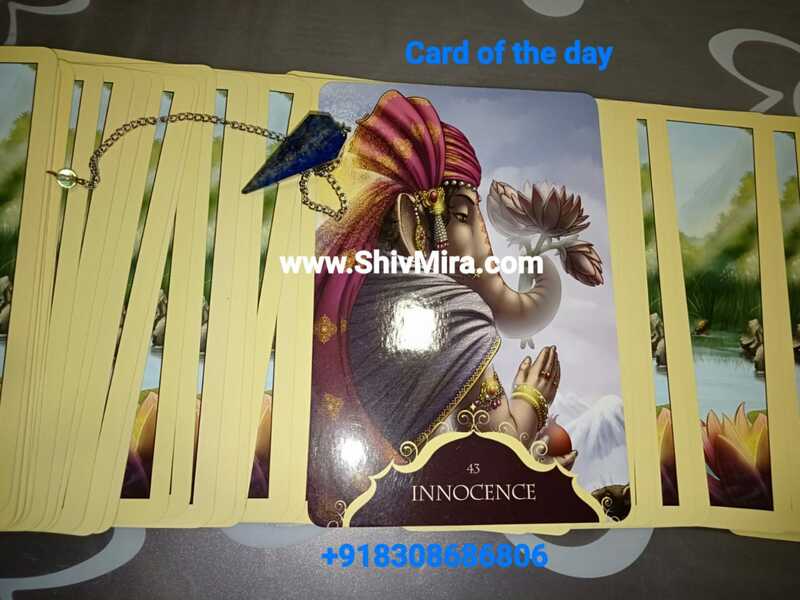 In this card, the lightness of the aura around Ganesha portrays innocence. By being soft and still, you give the Universe the opportunity to assist you in creating your desires. Be willing to release any cynicism. Have you noticed yourself becoming increasingly critical over time? As you gather more experience, sometimes the familiarity of a situation can cause you to lose touch with your innocence. It is only natural to expect similar outcomes as you have had in the past when similar situations present themselves in your life. Don’t forget though, that change and transformation are always possible. You are being offered an opportunity to approach this situation with renewed peace. If you are making changes to your job situation, relationships or even the direction of your life path, approach this with a sense of exploration and excited curiosity of a child. Be willing to let go of the preconceived ideas that have developed over time in your mind. Allow your heart to be centred and in place of peace. Every day call on Ganesha for guidance to renew your mind and refresh your thinking. With Ganesha’s assistance, contemplate each situation you encounter. Ask Ganesha support you. Remember to pray for freedom from fears, worries and unhealthy obsessions that might control your thoughts and harm your soul. Be accountable for your decisions and their results. Just knowing that you are responsible will assist you to take decisions seriously and with greater consideration. The world now is too practical. And there is more technical stuff in everything. Not just gadgets- even love has become technical.